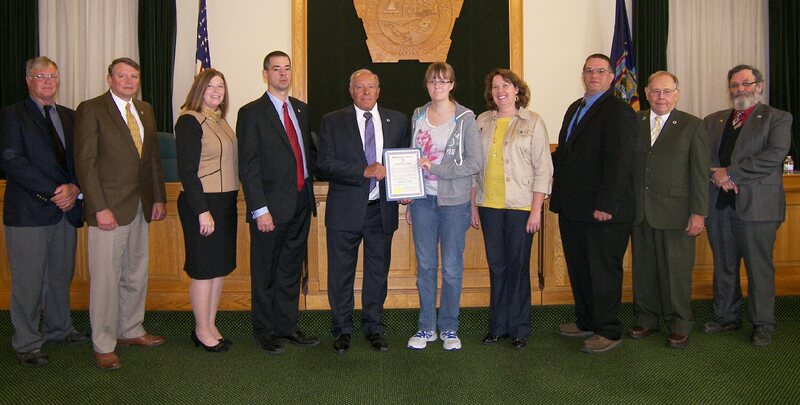 OSWEGO, NY – The Oswego County Legislature’s Economic Development and Planning Committee presented a proclamation designating October as 4-H Month in Oswego County. With the support of the Oswego County Legislature, Cornell Cooperative Extension serves rural and urban youth through 4-H Youth Development programs. Since 1921, generations of young people have benefitted from these programs, learning life skills to help them become upstanding citizens and serve their communities well. 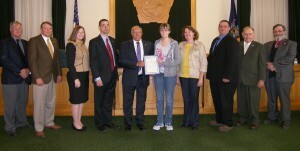 Pictured from left are Richard Kline, District 12; Roy Reehil, District 5; Amy Tresidder, District 16; Committee Vice Chairman Shawn Doyle, District 3; Committee Chairman Morris Sorbello, District 23; Christina Forestiere; Linda Brosch, 4-H program educator; Daniel LeClair, District 8; Milferd Potter, District 2; and Douglas Malone, District 20.